Making Valentine’s Day memories. 7 Great Date Night ideas — for you and your kids! Valentine’s Day is coming up—what are you and your sweetheart doing? Maybe an animated move? Jewelry shopping at Claire’s? Possibly LegoLand? I’m talking about Valentine’s Day with your sweetheart children, of course. Just like nurturing your adult relationships with one-on-one time, parents need that with their kids, too. One-on-one, mom-and-kid, memory making, fun! A few years back, I started a “date night” tradition with my kids and they LOVE it. We actually talk, we laugh, we share feelings or sometimes we’re just quiet together. The quality time is worth its weight in gold. Below are some date night ideas that I’ve used with my kids. I have a son and a daughter and they like completely different things. Whatever you choose, make sure it’s something your child will enjoy, even if it’s not your favorite. Trust me, when they’re having fun with you, you’re having fun, too. My daughter and I love our dinner date nights. I let her pick out my outfit, I let her wear whatever jewelry of mine she wants and we head out to any restaurant that has a table cloth. Why? Because we’re fancy. We’re dressed up. We immediately put our napkins in our laps and we use our best manners. Trust me when I tell you, it just “happens” that she’s at her most proper in a proper environment. Best yet, we have a chance to talk. No interruptions and no competing conversations with her brother—it’s just about us. My son has a thirst for knowledge. Seriously, the kid could stay in a museum from sunrise to sunset if he could. And I love to see his brain at work, churning with questions and ideas which make for great conversations. There are a ton of museums in the Worcester area and beyond and your local library often has free or discounted passes you can receive on loan. 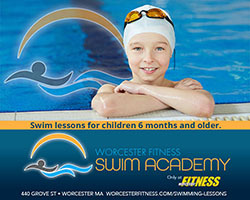 The greater Worcester area has a bunch of parent-kid classes including pottery painting, zumba classes, building workshops, art classes and more. It’s a time for you to be creative, fun and silly together. I’m the opposite of a pack-rat so I’m constantly filling bins and bags of used-but-useful items ready for donation. My son and I load the car up, bring it to one of our favorite donation spots and I let him hand over the goodies. He knows it’s going to someone else who can use it which makes him feel great. Then we go get an ice cream sundae of epic proportions. Like one that you would normally say “no way” to– with all the toppings, gooey drippings and sprinkles. Extra sprinkles. Can’t get out of the house? No problem. My girl and I shut ourselves in the bathroom for a while and do face masks (you can find super gentle “moisturizing masks” at the drug store), I paint her nails and we put hot towels around our necks, lay in mom’s bed and watch an episode of Four Weddings. Total girl time. Puzzles, Battleship, Jenga—you name it. I always let my child choose the game (even if I despise it) and we play for an hour or so while filling up on party snacks like popcorn, lemonade and M&Ms. This is not the time to bust out the organic fruit snacks, we splurge because if anything makes a marathon game of Monopoly bearable, it’s M&Ms. I love snuggling and I love reading, and so do my kids. If we’re finding it difficult (or too cold) to leave the house for a date night, we’ll grab a good book and head for mom’s bed. Sometimes we read to each other, sometimes we just enjoy quietly reading to ourselves. It’s not always about having to talk, we just enjoy being near each other for some alone time. What’s your favorite date night activity? Previous PostHomemade Valentine’s Day Treats. Eat your heart out! Next PostCrafty fun at Yankee Candle Village over school vacation week Feb. 16-24!